Sometimes it&apos;s not until you&apos;ve had some distance between drawing a comic and re-reading it that you spot issues. In the case of Corbie issue 1 it took so long to draw that it was almost a completely different animal by the time I got to the last page. The biggest issue was composition. Everyone&apos;s more-or-less on a single plane, the characters are all very small, and this was one of three panels in a row that were all like this. When Maxine hits the science project in the first frame, we see the impact after the event. It&apos;s not as dramatic because to the reader, the action has already happened. 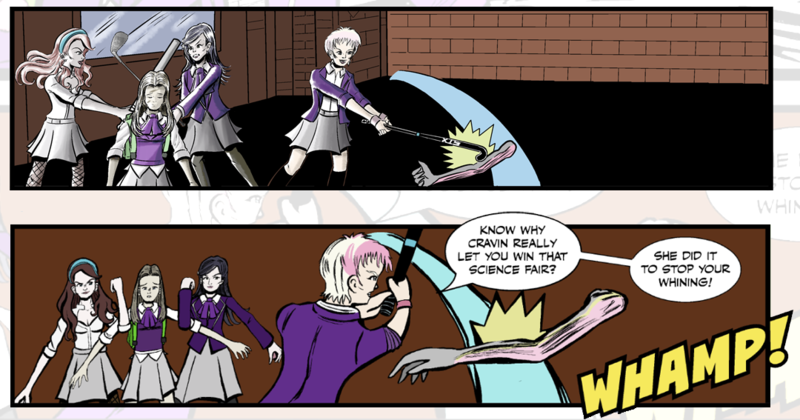 In the original art, Josie and Ruby pummel Corinne with a golf club and a baseball bat, respectively. To me it was way too much, in fact it may have been my primary motivation for redoing this sequence. If you&apos;re looking to learn about comic layouts and composition I highly recommend the (admittedly dated) How to Draw Comics The Marvel Way, and Will Eisner&apos;s three instructional books: "Comics & Sequential Art", "Graphic Storytelling & Visual Narrative", and "Expressive Anatomy for Comics & Narrative".